What the Heck is 666 About? 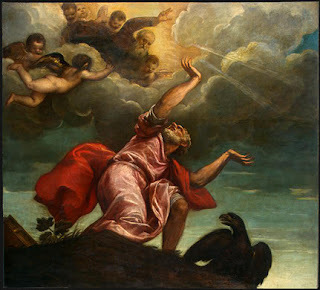 Titian: "Saint John the Evangelist on Patmos" c.1547. You will find many articles back in the “First Age” pages of HogueProphecy Bulletins dating back to the turn of the century. Once you have read the article and had a look around prophecies past, come back here to this page and leave me feedback on what you thought about my take on 666 by pushing the “comments” button (below). This entry was posted in 666 and tagged 666, Beast, John Hogue, John of Patmos, prophecy, Revelation. Bookmark the permalink. Post a comment or leave a trackback: Trackback URL. This is an example of some of the incoherent people that presume they can write a sentence that hints to what they don’t even understand is yammering inside their skulls. I usually just put these in the trash or spam file. But sometimes it’s good to share with readers what usually “doesn’t” get on these comments pages. Incoherent people, beware! Write like this fellow and you are sent to the Internet Spam limbo!